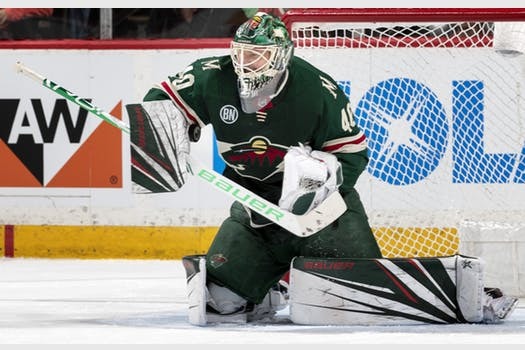 Wild goalie Devan Dubnyk’s job is to prevent goals, but he tried to help the team’s offense Monday in a 1-0 loss to the Predators with a unique strategy: pulling himself during 4-on-4 action. Dubnyk skated to the bench past the halfway point of the third period, hoping the Wild would replace him with an extra skater to gain a 5-on-4 advantage. And he did this because the Wild’s net was off its moorings, a circumstance he tried to exploit since he knew the play would be whistled down as soon as the Predators gained possession. But once he arrived at the bench, teammates clamored for him to return to his crease – not realizing what he was trying to orchestrate. Dubnyk finally acquiesced but when he did, the team was called for having too many men on the ice. The idea came to Dubnyk in the first period after the net was knocked ajar and he did nothing. He had recently read about Rangers goalie Alexandar Georgiev pulling the same stunt in a game earlier this month. Nashville’s lone goal came shorthanded in the first period, a sequence coach Bruce Boudreau felt was off-side even though he didn’t issue a coach’s challenge. Winger Ryan Donato had a team-high five shots and came close to tying it late in the third period when he sent a shot off the crossbar. While there were cheers slipping out from the Predators’ locker room after the game, as the team clinched a playoff berth, the Wild was much more subdued going into a three-day break in the schedule – a timeout in which its two-point deficit for the second wild card berth could expand since the Avalanche play Wednesday. “As long as we’re in a position to be able to make the playoffs, we’ll draw on that,” Boudreau said.